AnnieBenjamin.com | HER SONG 2018!!!! THIS JUST IN!! I am so very Happy to Announce that Echo Theatre will be producing “The Echo Room Presents : Her Song” for a FIFTH season!!! I am so thrilled to be included in this phenomenal cast for one more year!!! Kateri Cale, Lorena Davies, Terri Ferguson, Shelby Hibbs and I wrote this show in 2013. Our dear friend Scott Eckert arranged the music and directed the music side of things. I was frustrated by the lack of female songwriters recognized at various music conventions and symposiums I attended, so I approached my talented and lovely friends at Echo Theatre and asked them if they thought there was a way to write a musical review that featured works of American WOMEN songwriters between 1900 and about 1940… we spent months researching songs, composers, fashion styles, movies, musicals, publishing companies and popular trends before WWII. and we found INCREDIBLE music written by Women! 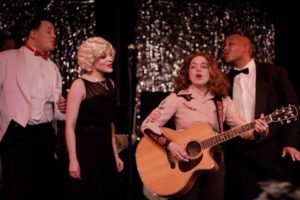 Her Song won the ” Steve Lovett Outstanding New Work by a Local Playwright Award ” at the 16th annual Dallas Column Awards. We start rehearsals in January and will run the entire month of February! MARK YOUR CALENDERS! This is probably going to be our last run in Dallas, and you won’t want to miss it! The cast is incredible, and the MUSIC… OH THE MUSIC…. http://anniebenjamin.com/wp-content/uploads/2016/04/logo-300x73.png 0 0 annie http://anniebenjamin.com/wp-content/uploads/2016/04/logo-300x73.png annie2017-08-29 23:17:502017-08-31 01:11:58HER SONG 2018!!!! THIS JUST IN! !